The bench press is a traditional upper body compound exercise used by athletes and recreational exercisers. But the bench press can also be used to test and predict your overall upper body strength. A common predictor is the relative strength formula for bench pressing that takes into consideration your body weight and one-rep maximum. The first step to calculating the relative strength formula is determining your one-repetition maximum, which is signified by 1RM. The 1RM is the maximum amount of weight that can be bench-pressed for only one repetition. To properly conduct the 1RM bench press test, start with a 10-minute warm-up followed by gradually increasing the weight until you near the 1RM weight. Always use a spotter or assistant in the case of a failed repetition and continue increasing the weight to maximize your relative strength. Your body weight is the second factor that influences the relative strength formula in bench pressing. 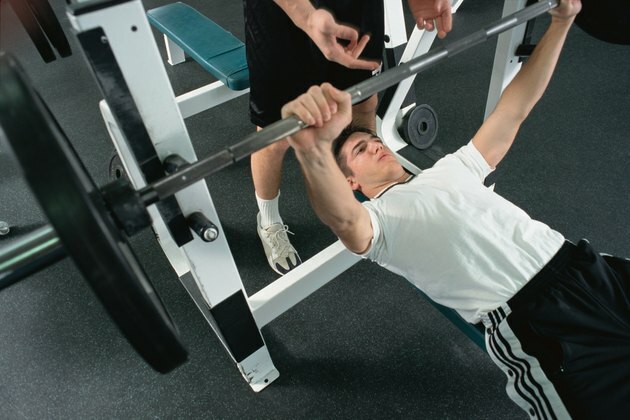 As your body weight increases, your bench press must also increase to maintain the same relative strength. As a result, most weightlifting or powerlifting competitions include different weight divisions to accommodate the various levels of relative strength. Weigh yourself on a digital scale to get an accurate measurement of your weight before calculating relative strength. Improving relative strength in bench pressing is accomplished by combining different training modalities. For example, perform multiple sets of heavy bench press followed by other functional body-weight movements such as pullups. This combination of exercises helps to maximize relative strength that builds a positive power-to-weight ratio. In the end, you become a more powerful athlete with improved athletic potential. After measuring your bench press 1RM and determining your weight, you can calculate your relative strength. The basic formula includes dividing your bench press 1RM by your weight. For example, a 200-pound football player with a 225-pound bench press 1RM has a relative strength of 1.125 (225/200=1.125). A positive number indicates a good amount of relative strength. What Is Considered a Good Bench Press Weight in High School?